Tickets available at the door or at https://ordovirtutum.eventbrite.com. Price: $20 General Admission, $10 Student. TWO PERFORMANCES ON MONDAY, JUNE 6: 4:00 PM & 6:00 PM. Vocatrix summons the heavenly sounds of 12th-century nun and mystic Hildegard von Bingen in a rare memorized and fully staged production of her morality play, Ordo Virtutum. 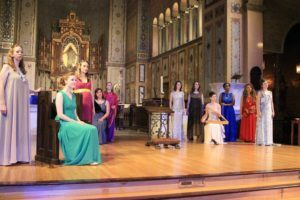 The all-female ensemble, based in Los Angeles, has crafted a new candlelight vision of the 900-year-old manuscript, tailored specifically to the Berkeley City Club Ballroom. They will be accompanied by a handful of California’s best period instrumentalists in a production that is “graceful, haunting…unforgettable.” Hildegard von Bingen was a composer of outstanding originality and beauty, and nowhere is her magic more brilliantly displayed than in her allegorical proto-opera, the Ordo Virtutum – the first work of its kind ever written.The work depicts the struggle of the human soul, Anima, torn between Vice and Virtue, and reverberates with themes that are suprisingly timeless: feminine strength and sisterhood, the power of nature, and humanity’s place in the universe. Ensemble Vocatrix is based in Los Angeles. The group of virtuose strives to interpret historical culture and find resonance in the new world. 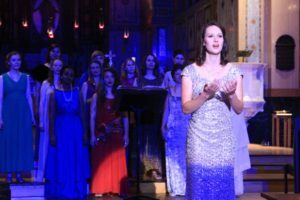 In their production of Ordo Virtutum, the group presents a medieval morality play that is at once accessible to modern audiences and faithful to the musical priorities of the piece. The ensemble prides itself on friendship and teamwork, pursuing themes of inspiration and sisterhood.